Recognizing that there was no Church outreach to homosexuals in the Washington, DC area, six people from various walks of life met in 1971 in the cafeteria of the National Shrine of the Immaculate Conception, and decided to come together to start a Catholic ministry to lesbian and gay people. In 1972, they started a chapter of Dignity in Washington, DC, three years after the founding of the national organization Dignity/USA. Thus was born Dignity/Washington. Dignity/Washington first met at the Newman Center on the campus of George Washington University. At that time, the chapter’s mission statement proclaimed that persons of a homosexual orientation are fundamentally good, not sinful – a revolutionary concept at the time. 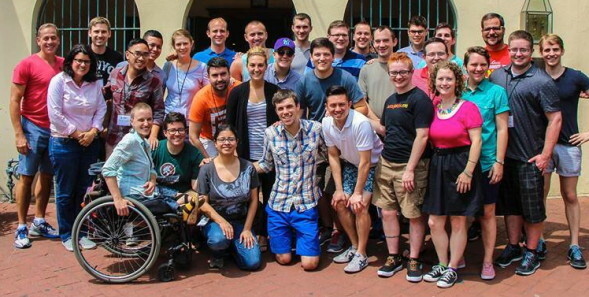 The original members hoped that Dignity would foster self-acceptance among lesbian and gay Catholics, and provide them with a social and spiritual sense of community and belonging. Community members met on the first and third Fridays of each month, with a social gathering or potluck following the liturgy. The community continually increased in size, and by 1975 had 40 members regularly attending liturgy. In 1976, the chapter initiated Sunday evening liturgies, which took place in the nursing residence building on Georgetown University’s north campus. 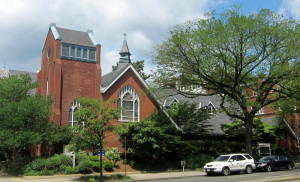 By 1979, Sunday Mass attendance had grown to almost 100 persons, and late that year, the chapter moved its worship site to the larger St. William’s Chapel on the Georgetown University campus. In October 1986, following the issuance of a Vatican letter asserting that gays and lesbians are “intrinsically disordered” and insisting that gay organizations should not be allowed use of Church property, Georgetown University informed Dignity/Washington that the chapter could no longer use any of the campus chapels. So, on June 22, 1987, Dignity/Washington’s membership marched from St. William’s Chapel in Georgetown to its new home-in-exile, at St. Margaret’s Episcopal Church in Dupont Circle. Dignity/Washington has continued to hold its weekly Sunday evening Masses at St. Margaret’s Church to this day. In the Fall of 1998, Dignity/Washington took a bold step forward, purchasing its own building – The Dignity Center. Located on Capitol Hill, in the “Barracks Row” area of 8th Street, SE, this building serves as not only Dignity/Washington’s office, but as our center for a variety of spiritual, educational, and social activities for our chapter, and for those to whom we minister. Today Dignity/Washington numbers almost 200 active members, and sponsors hundreds of liturgies and other events and activities throughout the year. We invite you to please join us as we celebrate Sunday Eucharist together at St. Margaret’s Church in the DuPont Circle neighborhood in Washington, DC or for one of our many programs and events held throughout the year at the Dignity Center in Capitol Hill’s Eastern Market area.